Despite my best attempts; I have realized my ladies just will not be what I have envisioned; meaning, they will not easily come to me when ready to go back in cage (instead prefer to run away) and will not "love" me the way that I love them. That being said, I will continue to love them, hold them, tent time, and be the best owner that I can be. Perhaps one of these days, my 3 ladies will surprise me. I anxiously await for that day. Try bribery, set their pouch so that it is a little bit open and put a couple treats in the pouch. If you must catch them use a piece of fleece in your hand or another pouch with your hand inside. Do you carry them in a bonding pouch? Cut up pieces of fleece and wear the fleece in your bra after a couple days put it in their pouch so they can smell you. Have you read this post? Building a relationship with your glider. I will go read the post now. I understand your feelings and frustration if you've reached that point. But, you haven't had them for even a full year as yet. I was so relieved when I read where you are planning on still loving and continue spending time with them. Hang on, be consistent and persistent with that. 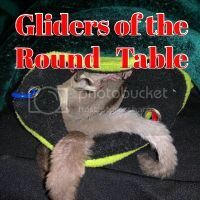 Each glider has their own speed and capacity in which they develop full trust and the extent of it. It can take a while, a long while for some. Accepting them where they are and learning to work with them from that point will make a huge difference. Thanks for the encouragement. I am/won't be that type of owner to get rid of an animal just because it doesn't form to my wants. Yeah, Fiona is my cuddler, and Dot hated me. She attacked my hand while removing and putting dinner dishes in, she was a mess. She still doesn't tolerate much. We've had them both since 2014... she is less social with me, but loves male humans. My grandson can hold her and pet her. He and my husband are the only ones. I hold her or pet her, not at the same time. Oh she also loves male vets. Give it more time before giving up your hopes. Maybe they won't be the perfect match, but you're basically taming wild animals. I've had mine going on two years & still wish they were more bonded than they are. As it is, I think the boys merely tolerate me most days. Could you tell us what you are not getting from them that you want? What you describe most owners would be very pleased with, so I am curious what is missing. It is not surprising they wouldn't be ready for out of cage play time to be over so they would run knowing you were going to return them to their cage. They can be very smart creatures They also will not react like dogs or even some cats when called. Most will pretty much do what they want to do. Honestly Karen; I guess I would like to see on videos or others posts. I would like to hold my ladies outside of the pouch and tent. I would like "not to have to chase" them"
I am glad that you say that most owners would be pleased with my status; it appears to me that most owners have better luck than I do. Thanks to the advice given today, I now understand that it is normal for them to run and have issues returning to cage. 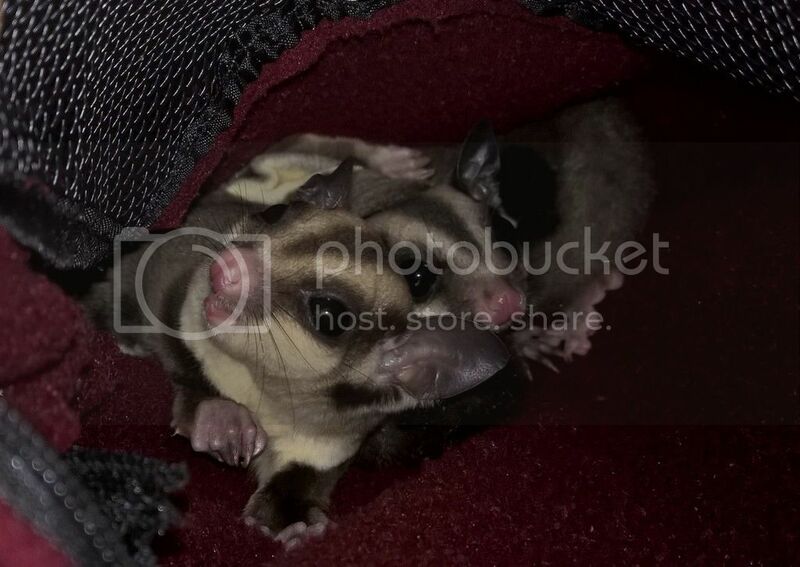 When my pair were still joeys, I was so anxious about letting them out of the cage because it was so hard to get them to go back in. Then I developed a routine of letting them out to play as soon as I got out of bed in the morning, which was just a little while before they naturally fall asleep for the day. So my confidence grew around letting them out of the cage in the morning hours, because I knew that they would settle down into a pouch or some other comfy place within about 30 minutes. The less anxiety I had, the more comfortable they were with me, and so keeping that routine up over time helped develop trust between us. I've had mine for about 18 months now and one of them is closely bonded to me, but the other is still skittish. Even the one who is fully bonded (he likes sleeping next to my skin) still has his own mind and won't come to me unless that's exactly what he wants to do. Honestly, it sounds like you're doing great. Just keep it up, spend time with them, and your bonds will deepen over time. Good luck! P.S. If you don't want them to run... don't chase! Sit still long enough and they'll come to you. Thanks Stef333 and all the other posts. I will try the free range tomorrow when I have time to sit/observe without having to be someplace. I will start with Athena as she usually stays in the living room. Keep track of them, chasing or not. These little buggers disappear quick! Totally agree. One minute on the couch and the next in the dining room; hence why only 1 comes out at a time. Yes! Sorry that I was remiss on that point. My space is so small now that I can have an eye on both of my gliders at the same time, even when they're at opposite ends of the house, but I definitely make sure that I know where both of them are at all times. In our earlier days together, and when we were in a larger space, I only let them out one at a time.